ItemI-52768 - Flume #21. Station 850, zinc sheets and rods distributed ready to erect. ItemI-52769 - Flume #17. Flume erecting car with zinc sheets and rods - Oliver project. ItemI-52770 - Flume #17. End view of erecting car - Oliver project. ItemI-52771 - Graph; BC forest area comparison with European countries. 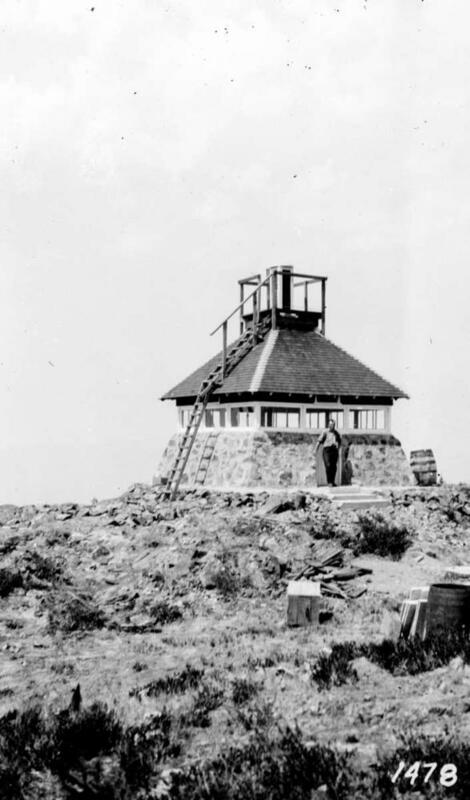 ItemI-52772 - Forest Service; lookout in BC. ItemI-52773 - A seed trap in BC. ItemI-52774 - A natural seeding on Vancouver Island. ItemI-52775 - Transport by caterpillar tractors in British Columbia. ItemI-53142 - Raft on Nanika Lake, Martello Mountain in background. Item I-52772 - Forest Service; lookout in BC.